Monday Night Raw is chaos. The championship belt is missing. Announcer tables are destroyed. John Cena’s handcuffed to Mark Henry. Who could possibly be responsible for such wanton damage ? Find out in an all-new action/comedy/adventure WWE-style! Monday Night Raw is chaos. The championship belt is missing. Announcer tables are destroyed. John Cena’s handcuffed to Mark Henry. Wrestling ring ropes are snapped in half. Four Superstars are to blame – CM Punk, Rob Van Dam, Daniel Bryan, and Rey Mysterio. Problem is, none of them can remember a thing. Now they must retrace their steps over the past few hours to uncover how they could possibly be responsible for such wanton damage and save their jobs with Triple H and the McMahons. 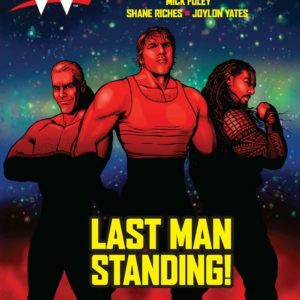 An all-new action/comedy/adventure WWE-style! Collects WWE SUPERSTARS issues #5-8!